Group will present Agricultural Leadership and Excellence Award to Roberts on Oct. 25. The Agricultural Business Council of Kansas City has named U.S. 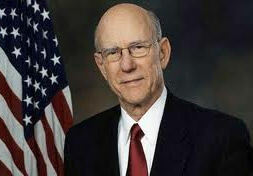 Senator Pat Roberts as the recipient of the group's 2011 Jay B. Dillingham Award for Agricultural Leadership and Excellence. Roberts will be honored at an Oct. 25 awards luncheon at the historic Kansas City Club in downtown Kansas City. "The Agricultural Business Council is delighted to honor one of the region's outstanding advocates for agriculture," said Council Chairman Elvin Hollon in announcing the award. "During his distinguished public service representing Kansas both as a Congressman and currently as its U.S. Senator, Roberts' commitment to agriculture has been unwavering." Hollon noted Senator Roberts has helped Congress focus on maintaining the production agriculture safety net, expanding trade opportunities for farmers and ranchers, conducting oversight of regulations that threaten the competitiveness of America's farmers, and maintaining the security and science based sustainability of food and agriculture sectors. "Senator Roberts has a reputation as a national leader in agriculture. As the ranking member on the Senate Agriculture Committee, and a representative from one of the nation's top producing states, Senator Roberts continued commitment to the food and agriculture sectors, helps shape the current and future outlook of agriculture in Kansas and in the Midwest. The region is fortunate to have such a dedicated public servant to its largest industry," said Hollon, an executive with Dairy Farmers of America. Hollon also recognized Senator Roberts's leading role in ensuring the nation's security as former chairman of the Senate Intelligence Committee. His tireless effort in working with the U.S. Department of Homeland Security and the U.S. Department of Agriculture has brought to Kansas the National Bio and Agro-Defense Facility (NBAF), a facility dedicated to the research and development of countermeasures to combat high-consequence biological threats. The 2011 Award for Agricultural Leadership and Excellence, named in honor of the late Jay B. Dillingham, is awarded annually to those who embody the leadership, spirit and drive which fuels the economic growth of the Heartland's agribusiness industry. The October 25 event will be hosted at The Kansas City Club, 918 Baltimore Avenue in Kansas City, Mo. at 11:30 a.m. for networking and noon for lunch. Tickets are $75 per person or $500 for a table of eight. Reservations can be made by contacting Erica Venancio at Erica.Venancio@agbizkc.com or by going to www.agbizkc.com.